1. a proceeding outward from a common center. 2. a structure made up of parts that go outward from a center, especially a tract of the central nervous system made up of fibers that go out in different dfirections. 3. energy carried by waves or a stream of particles. One type is electromagnetic radiation, which consists of wave motion of electric and magnetic fields. The quantum theory is based on the fact that electromagnetic waves consist of discrete “packets” of electromagnetic radiation, called photons, which have neither mass nor charge and have an energy inversely proportional to the wavelength of the wave. In order of increasing photon energy and decreasing wavelength, the electromagnetic spectrum is divided into radio waves, infrared light, visible light, ultraviolet light, and x-rays. Another type is the radiation emitted by radioactive materials. alpha particles are high-energy helium-4 nuclei consisting of two protons and two neutrons, emitted by radioisotopes of heavy elements such as uranium. beta particles are high-energy electrons emitted by radioisotopes of lighter elements. gamma rays are high-energy photons emitted along with alpha and beta particles and also emitted alone by metastable radionuclides, such as technetium-99m. Gamma rays have energies in the x-ray region of the spectrum and differ from x-rays only in that they are produced by radioactive decay rather than by x-ray machines. Radiation with enough energy to knock electrons out of atoms and produce ions is called ionizing radiation and includes alpha particles, beta particles, x-rays, and gamma rays. This kind of radiation can produce tissue damage directly by striking a vital molecule, such as DNA, or indirectly by striking a water molecule and producing highly reactive free radicals that chemically attack vital molecules. The effects of radiation can kill cells, make them unable to reproduce, or cause nonlethal mutations, producing cancer cells or birth defects in offspring. The radiosensitivity of normal tissues or cancer cells increases with their rate of cell division and decreases with their rate of cell specialization. Highly radiosensitive cells include lymphocytes, bone marrow hematopoietic cells, germ cells, and intestinal epithelial cells. Radiosensitive cancers include leukemias and lymphomas, seminoma, dysgerminoma, granulosa cell carcinoma, adenocarcinoma of the gastric epithelium, and squamous cell carcinoma of skin, mouth, nose and throat, cervix, and bladder. The application of radiation, whether by x-ray or radioactive substances, for treatment of various illnesses is called radiation therapy or radiotherapy. Three types of units are used to measure ionizing radiation. The roentgen (R) is a unit of exposure dose applicable only to x-rays and gamma rays. It is the amount of radiation that produces 2.58 × 10−4 coulomb of positive and negative ions passing through 1 kilogram of dry air. The rad is a unit of absorbed dose equal to 100 ergs of energy absorbed per 1 g of absorbing material; the absorbed dose depends both on the type of radiation and on the material in which it is absorbed. The rem is a unit of absorbed dose equivalent that produces the same biologic effect as 1 rad of high-energy x-rays. For beta and gamma radiation, 1 rem is approximately equal to 1 rad; for alpha radiation, 1 rad is approximately 20 rem. Previously, doses administered in radiation therapy were commonly specified as measured exposure doses in roentgens. The current practice is to specify the absorbed dose in the tissue or organ of interest in rads. Many personnel monitoring devices read out in rems. Eventually, the rad and rem may be replaced by the new SI units, the gray and sievert; 1 gray equals 100 rad, and 1 sievert equals 100 rem. Radiation Hazards. Harmful effects of radiation include serious disturbances of bone marrow and other blood-forming organs, burns, and sterility. There may be permanent damage to genes, which results in genetic mutations. The mutations can be transmitted to future generations. Radiation also may produce harmful effects on the embryo or fetus, bringing about fetal death or malformations. Long-term studies of groups of persons exposed to radiation have shown that radiation acts as a carcinogen; that is, it can produce cancer, especially leukemia. It also may predispose persons to the development of cataracts. Exposure to large doses of radiation over a short period of time produces a group of symptoms known as the acute radiation syndrome. These symptoms include general malaise, nausea, and vomiting, followed by a period of remission of symptoms. Later, the patient develops more severe symptoms such as fever, hemorrhage, fluid loss, anemia, and central nervous system involvement. The symptoms then gradually subside or become more severe, and may lead to death. Radiation Protection. In order to avoid the radiation hazards mentioned above, one must be aware of the three basic principles of time, distance, and shielding involved in protection from radiation. Obviously, the longer one stays near a source of radiation the greater will be the exposure. The same is true of proximity to the source; the closer one gets to a source of radiation the greater the exposure. Shielding is of special importance when time and distance cannot be completely utilized as safety factors. In such instances lead, which is an extremely dense material, is used as a protective device. The walls of diagnostic x-ray rooms are lined with lead, and lead containers are used for radium, cobalt-60, and other radioactive materials used in radiotherapy. Monitoring devices such as the film badge, thermoluminescent dosimeter, or pocket monitor are worn by persons working near sources of radiation. These devices contain special detectors that are sensitive to radiation and thus serve as guides to the amount of radiation to which a person has been exposed. For monitoring large areas in which radiation hazards may pose a problem, survey meters such as the Geiger counter may be used. The survey meter also is useful in finding sources of radiation such as a radium implant, which might be lost. Sensible use of these protective and monitoring devices can greatly reduce unnecessary exposure to radiation and allow for full realization of the many benefits of radiation. Penetrating capacity of different types of radiation. From Ignatavicius and Workman, 2002. Radiation is emitted by radioactive material. 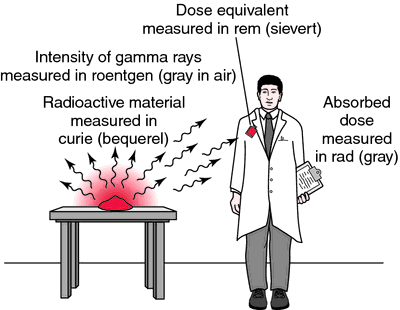 Radiation quantity is measured in roentgens, rads, or rems, depending on precise use. From Bushong, 2001.
corpuscular radiation particles emitted in nuclear disintegration, including alpha and beta particles, protons, neutrons, positrons, and deuterons. electromagnetic radiation energy, unassociated with matter, that is transmitted through space by means of waves (electromagnetic waves) traveling in all instances at 3×1010 cm or 186,284 miles per second, but ranging in length from 1011 cm (electrical waves) to 10−12 cm (cosmic rays) and including radio waves, infrared, visible light and ultraviolet, x-rays, and gamma rays. extrafocal radiation radiation that arises from a source other than the focal spot of the x-ray tube. infrared radiation the portion of the spectrum of electromagnetic radiation of wavelengths between 0.75 and 1000 μm; see also infrared. interstitial radiation energy emitted by radium, radon, or some other radiopharmaceutical inserted directly into the tissue; see also radiation therapy. ionizing radiation corpuscular or electromagnetic radiation that is capable of producing ions, directly or indirectly, in its passage through matter. See also radiation. primary radiation that coming directly from a source, such as a radioactive substance or an x-ray tube, without interactions with matter. pyramidal radiation fibers extending from the pyramidal tract to the cortex. scatter radiation (secondary radiation) that generated by the interaction of primary radiation with matter. See illustration. 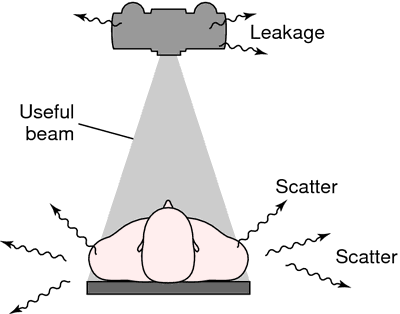 Three types of radiation—the useful beam, leakage radiation, and scatter radiation. From Bushong, 2001.
striothalamic radiation a fiber system joining the thalamus and the hypothalamic region. tegmental radiation fibers radiating laterally from the nucleus ruber. thalamic r's fibers streaming out through the lateral surface of the thalamus, through the internal capsule to the cerebral cortex. ultraviolet radiation the portion of the spectrum of electromagnetic radiation of wavelengths between 0.39 and 0.18 μm; see also ultraviolet rays. radiation consisting of streams of subatomic particles such as protons, electrons, neutrons, etc. the radiation associated with subatomic particles, such as electrons, protons, neutrons, or alpha particles, which travel in streams at various velocities. All such particles have definite masses and have radiation properties very different from those of electromagnetic radiations, which have no mass and travel as waves at the speed of light. See also background radiation, leakage radiation, scattered radiation. Physics Radioactive particles–electrons, protons, alpha particles, deuterons, pi-mesons, and others, which vary in terms of mass, charge, and energy proportional to speed. Cf Electromagnetic radiation. Radiation consisting of streams of subatomic particles such as protons, electrons, and neutrons. radiation consisting of moving particles of matter, usually submolecular particles such as α-particles, protons and electrons.